A day so nice they made it twice — September 26 is the year’s second National Pancake Day! Get those hotcakes on the griddle, it’s time to prepare some pancakes! Pancakes are an old staple, dating back to Ancient Greece. Since then, many varieties have been created across the globe. In Britain, France, and other parts of Europe, their pancakes (or crepes) are thin and often served with a sweet or savory filling. In Indonesia they consume pancakes known as “serabi”, which are made with rice flour and coconut milk. In Uganda pancakes are made with bananas. These are just a few of the many different variations across the globe. All are delicious and worth celebrating on National Pancake Day! Whichever style of pancake you prefer, get ready to enjoy a stack of them on September 26! WHEN IS NATIONAL PANCAKE DAY 2019? 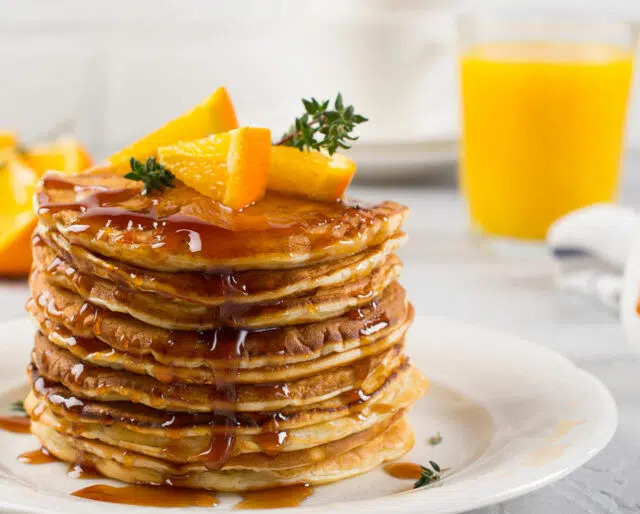 National Pancake Day occurs twice a year, and the National Pancake Day on September 26th is actually the second iteration of the holiday. Of course, IHOP’s National Pancake Day is more than just an excuse to fill up on the floury treats—IHOP also partners with a number of charities that help children battling critical illness, with donations on the day going straight to the charity of your choice. It may seem obvious but there's no better way to celebrate National Pancake Day than to whip up some pancakes (and lots of 'em). You can make fluffy pancakes, crepes, sweet or savory flapjacks, or try a new recipe. You can make them with your friends or your kids. No matter what pancakes you choose to make, have fun and enjoy a large stack of them! If you’ve never had breakfast for dinner, specifically pancakes, you are missing out! Celebrate National Pancake day by whipping some up for your evening meal. Typical sweet pancakes are great for dinner when paired with bacon, sausage, and eggs, but savory pancakes are great for an evening meal too! Get creative and make the perfect pancake dinner! Pancake art has become a trendy lately with creative minds like Nathan Shields posting their fun flapjacks on YouTube. It may take a few tries, but you can make cool pancake art too! There are tutorials online on how to get it just right, but it involves adding batter to the pan at different places and at different times (thus the color difference throughout). You can divide up your batter and add food coloring to each to make your pancake art colorful if you like! Oh, and don’t forget to make your pancake art in mirror image so when you flip it over it’s facing the correct way. It may sound a little tricky but it’s so much fun! With so much variety in the pancake world, there are endless ways to enjoy these flavorful flapjacks. Some are thin and some are fluffy. Some are made with fruit and some are made with vegetables. Some are sweet and some are savory. Every country or region seems to have their own take on pancakes and they are loved in every culture. With so many varieties, there are endless options to keep breakfast (or any meal) new, delicious, and exciting! While pancakes are generally seen as a breakfast food, they don’t have to be! Pancakes are great for breakfast, lunch, dinner, and dessert! Breakfast for dinner is always a delicious idea, but you can have them any time of day! Indulge with pancakes for dessert with fruit, chocolate, whipped cream, and more! There’s no limit to when and how you can enjoy your pancakes and that’s one thing we love about them! There’s no denying that pancakes are a comforting food that make us feel good. We enjoy them as children and adults and they are a beloved staple in many culture. The smell of them alone can make us feel content, reminding us of lazy Saturday mornings waking up to a pancake breakfast and a hug from mom. It’s a happy food, and happy food makes for happy tummies!